ROXAS City — The provincial government received P7 million from the Department of Interior and Local Government (DILG) for winning the Seal of Good Housekeeping last year. Gov. Victor Tanco Sr., together with Vice Gov. 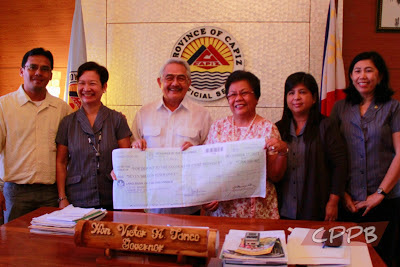 Esteban Evan Contreras and the Capitol department heads, got the check from DILG-6 Director Evelyn Trompeta at the Office of the Governor the other day. The amount was taken from the agency’s Performance Challenge Fund. Tanco said the amount will be used to improve the delivery of services to Capiceños, specifically the rehabilitation of some provincial roads. He also expressed confidence that Capiz will again earn the Seal of Good Housekeeping this year. “I’m sure we can have it because we are always in the top three of DILG’s Excellence Award,” he said. Capiz was awarded the Seal for “[complying] with the requirement of transparency and accountability by posting the liquidation of trust funds in conspicuous places,” Trompeta said.